Researchers at MIT have developed a 3D printable hydrogel that can sense and respond to stimuli. 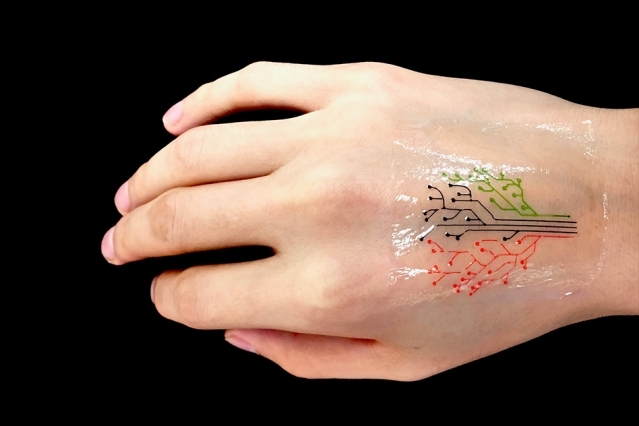 The hydrogel is loaded with bacteria that can be genetically programmed to light-up when they come in contact with certain chemicals and, therefore, could be used as living sensors. To demonstrate the living ink's abilities, the researchers printed the hydrogel in a tree pattern with different sections of the tree's branches containing bacteria sensitive to different types of chemicals. They then smeared those chemicals on a person's skin and put the 3D-printed tree-shaped "living tattoo" on top. When the branches came in contact with those chemicals, the bacteria were triggered to fluoresce. "This is very future work, but we expect to be able to print living computational platforms that could be wearable," researcher Hyunwoo Yuk said in a statement. Some examples of possible future applications of this type of technology could be living sensors programmed to monitor inflammatory biomarkers or ingestible versions that can affect gut microbiota. Bacteria-loaded materials like this could also be used to sense pollutants in the environment or changes in temperature, for example. The research was published today in Advanced Materials and you can check out the video below for more information on the project.